SYNOPSIS: With the help of the handsome, self-destructive Will and the fiercely devoted Jem, Tessa discovers that the Magister’s war on the Shadowhunters is deeply personal. He blames them for a long-ago tragedy that shattered his life. To unravel the secrets of the past, the trio journeys from mist-shrouded Yorkshire to a manor house that holds untold horrors, from the slums of London to an enchanted ballroom where Tessa discovers that the truth of her parentage is more sinister than she had imagined. When they encounter a clockwork demon bearing a warning for Will, they realize that the Magister himself knows their every move—and that one of their own has betrayed them. If you’ve read my Clockwork Angel review, you already know that this series didn’t start out on the right foot with me. After how much I have been loving The Mortal Instruments as a series, I was so hyped to start this trilogy that I never imagined it might be anything less than amazing. Unfortunately, the first half of this middle book suffered the same problems as the entirety of the first book: I couldn’t connect to the story, I didn’t care about most of the characters, and I was bored. Thankfully, sometimes it just takes a little time for a book to “click” with its reader, and in the end, Clockwork Prince finally clicked with me. I never thought I would say this about any book in my life, but what finally made me start to love this series wasn’t the plot, or any specific character, or a twist, or a theme… it was the love triangle. If you haven’t read this series, let me tell you, I am convinced that it is the singular greatest exception to the rule when it comes to my general distaste for love triangles, because I have never, in my entire reading life, rooted so hard for both love interests as I do in this triangle. 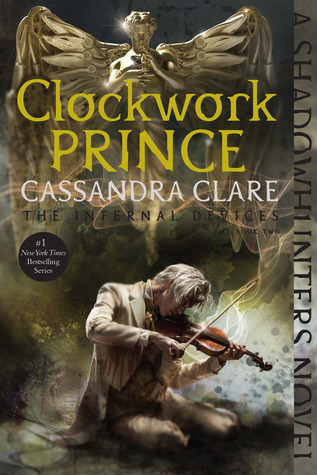 All in all, while it wasn’t a perfect read, I was still entertained, and the ending definitely has me simultaneously looking forward to and terrified of Clockwork Princess. I’ve already been warned to keep tissues on hand, and I’m sure I’ll be posting plenty of updates to let those of you who have already read the series cry right along with me. *record screeching to a halt* WAIT. You guys didn’t really think I could get through an entire one of these reviews without gushing over my sweet little bisexual warlock baby Magnus, did you?! Seriously though, oh my word, my poor heart and everything that this precious, wholesome, lovesick puppy does to me in each and every one of these books. I would read endless books just about Magnus Bane and never tire of them. One last thing: let’s talk about the audiobook narrators. I may reread this right after I catch up on the universe, because it feels like I missed a lot. It alternates between two narrators, Ed Westwick and Heather Lind, and while I loved listening to Heather Lind, Ed Westwick’s narrating voice is so muddled (and, at times, cringe-inducing) that I had to replay bits to make out what he said. It’s not an issue of accent (most of the audio narrators I listen to are also English); not to be cruel, but I just don’t think he’s a very good narrator. He also narrated part of City of Fallen Angels, and I had the same issue in that one—I actually switched back to the physical format after only one chapter of that one, but in this book’s case, I needed something to listen to while running errands a lot over the last two weeks. I’d be really interested to know if I would’ve liked the book better without his narrative pulling me out of the story constantly. (Sorry, Gossip Girl fans!) Anyways, he doesn’t narrate anything besides those two books, so I’d recommend steering clear of this one and Fallen Angels, but I hear the rest of the audiobooks are great and I look forward to finding out for myself! Yay, I’m so happy you finally enjoying this series! I think everyone is agree that this series has the BEST love triangle, it’s very bittersweet and painful. I hope you’ll enjoy the third book too! It really is the best! Thank you. I’m hoping to start City of Lost Souls either tonight or tomorrow, and then Clockwork Princess as soon as I finish it! Yessss, it was so much better honestly! Ugh, the triangle. ♥ So precious and painful. I’ll have to check your review out as soon as I finish the trilogy! Yes this love triangle is the best and I just want everyone to be happy dammit! I still need to read Clockwork Princess though.. Right!! I want them all to be safe and happy and loving each other lmao. ♥ Ooooh, you are in for a doozy but it’s easily my favorite in the trilogy!